Launch and perform basic Skype for Business tasks right from your navigation bar in Yammer in Office 365. To use this, you need a Skype for Business license as part of your Office 365 subscription. On the navigation bar, click (or tap) the Skype for Business icon ( ). Choose the Skype for Business task that you want to do. Click (or tap) the magnifying glass ( ). In the search box, type the name of who you want to contact. Select the person from the contacts list. To add the person to your contacts list, click Add To Contacts. Click (or tap) the address book icon ( ). Choose a contact from the list or search for someone else. Click (or tap) the plus sign ( ). In the conversation window, type your message. To add other people to the conversion, click (or tap) the add people icon ( ). Look in the sidebar (below the task symbols) to see if you have active conversations. New messages in these conversations will show an orange badge. When someone initiates a new conversation with you, you'll be notified by a blue badge on the Skype for Business icon ( ) on the Office 365 navigation bar. Hover over a user's name in Yammer to see a hover card with the profile information of the user. 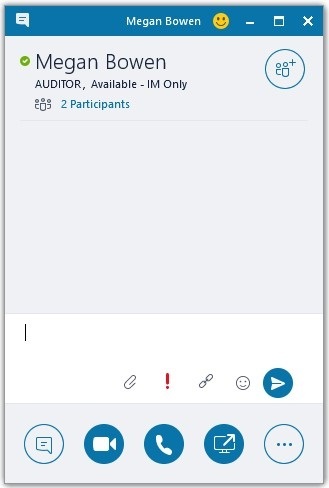 In the hover card, you will see the Skype for Business presence status of the user. To visit the profile page of a user, click a user's name in Yammer. You will see the Skype for Business presence status of the user. 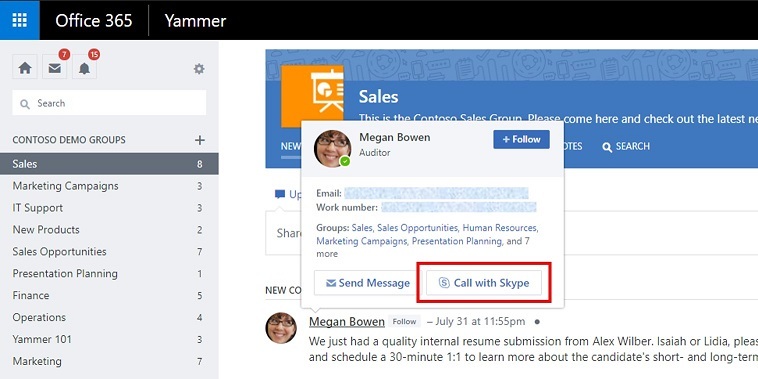 In the Yammer user hover card, click Call with Skype. This launches the Skype for Business desktop client and opens a chat with that person. 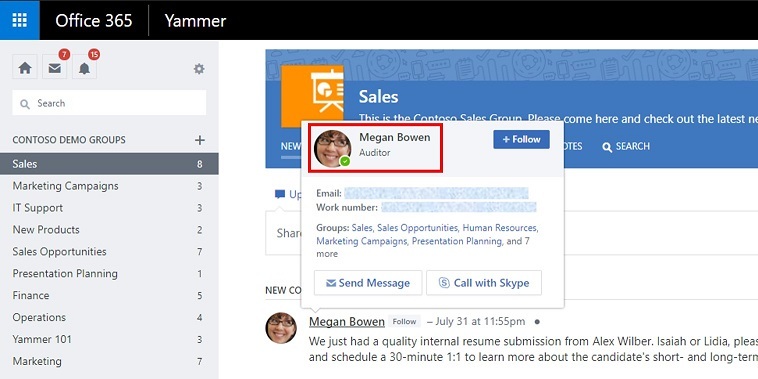 To find Call with Skype, go to the profile page of a user, and click the user's name in Yammer. What happens if I have on-premises Skype for Business (no Skype for Business online account)? For a user without a Skype for Business license in their Office 365 account, the Skype for Business icon on the Office 365 navigation bar is not visible. 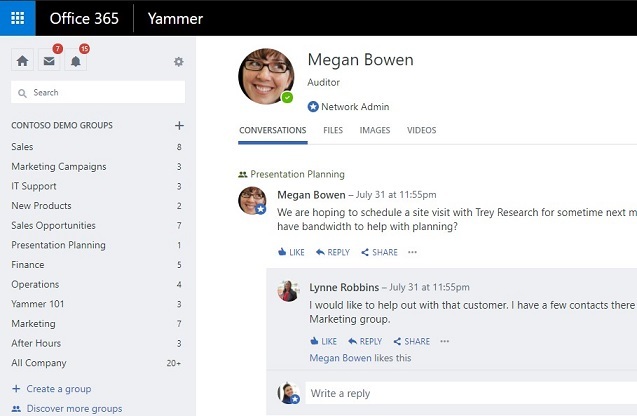 Also, none of the integrated experiences in Yammer will be visible. This requirement for Skype for Business online is the same as that for Outlook Web Access - more information here. Is the Skype for Business integrated with Yammer mobile apps? This is part of our future plans, but currently, integration with Skype for Business is only available with the Yammer web experience. What are the Skype for Business online presence states? Here is the list. Read more here about Skype for Business online presence status. Note: Want to experience all of the full, rich features of Skype for Business? Find out how to download Skype for Business across all your devices.